Government of Dubai firm Emirates Transport Corporation hiring Staff in 2019. 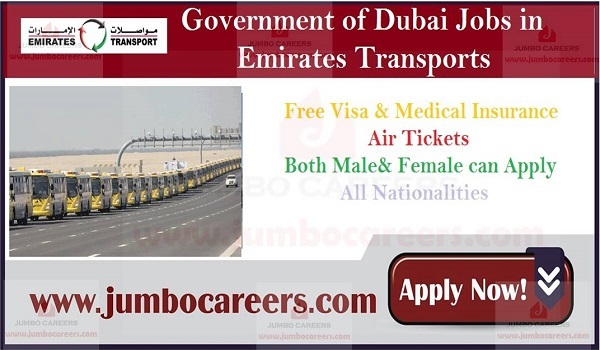 Current vacancies with Emirates Transport Corporation Dubai in 2019 includes Car washers, Receptionist, Accountants, Marketing manager, auto mechanic etc..
Its a free and direct recruitment by the Dubai government company with free visa and other attractive benefits including medical insurance and air tickets. * Car Washer preferable with having experience in car washing light and heavy vehicle. * Receptionist preferable with diploma in Mechanical/Automobile Engineering along with 3 years experience. * Accountant must hold bachelor’s degree in Accounting with 3 years experience in a similar role. * Debt Collector must hold bachelor’s degree in Accounting with 3 years similar experience. * Storekeeper preferable with diploma in Mechanical/Automobile Engineer along with 10-12 years of experience. * Marketing Manager must hold MBA/Bachelor’s degree in Mechanical Engineering with at least 15 years experience. * HR Coordinator must hold bachelor’s degree in Human Resources with 3 years related experience. * Auto Electrician preferable with ITI Certificate/Diploma in Automobile or Mechanical Engineering with 3 years experience. * Assistant Auto Electrician preferable with basic qualification (primary/preparatory certificate) with 3 years of experience in large automobile workshop. * Auto Denter preferable with basic qualification (primary/preparatory certificate) with 3 years of experience in MIG, ARC and TIG. * Auto Painter preferable with basic qualification (primary/preparatory certificate) with 3 years of experience in automobile workshop. * Auto Mechanic preferable with ITI Certificate/Diploma in Automobile or Mechanical Engineering along with 5 years of experience in repair and maintenance of Japanese and European vehicles. * Welder preferable with basic qualification (primary/preparatory certificates) along with 3 years of experience in MIG, ARC and TIG welding. * Project Manager must hold bachelor’s degree in Mechanical Engineering with 15 years of experience in managing services of automobiles, light and heavy vehicle etc. How To Apply For Emirates Transport Careers Dubai 2019?